References m_windowMain, s_delete_clicked(), s_destroy_clicked(), and s_response_triggered(). References abiDialogSetTitle(), XAP_App::getStringSet(), XAP_StringSet::getValueUTF8(), AP_Dialog_Stylist::m_bIsModal, XAP_Dialog::m_pApp, m_windowMain, m_wStyleListContainer, newDialogBuilder(), and s.
References Stylist_tree::getNameOfRow(), Stylist_tree::getNumCols(), Stylist_tree::getNumRows(), XAP_App::getStringSet(), Stylist_tree::getStyleAtRowCol(), AP_Dialog_Stylist::getStyleTree(), XAP_StringSet::getValueUTF8(), XAP_Dialog::m_pApp, m_wModel, m_wRenderer, m_wStyleList, m_wStyleListContainer, s, s_compare(), pt_PieceTable::s_getLocalisedStyleName(), s_types_clicked(), s_types_dblclicked(), AP_Dialog_Stylist::setStyleTreeChanged(), style, tree_select_filter(), AP_Dialog_Stylist::updateDialog(), UT_ASSERT, UT_DEBUGMSG, UT_SHOULD_NOT_HAPPEN, and xxx_UT_DEBUGMSG. References AP_Dialog_Stylist::finalize(), m_windowMain, m_wRenderer, and m_wStyleList. Referenced by s_response_triggered(), and s_types_dblclicked(). References _connectSignals(), _constructWindow(), _populateWindowData(), abiDestroyWidget(), abiRunModalDialog(), AP_Dialog_Stylist::m_bIsModal, AP_Dialog_Stylist::setStyleValid(), and UT_return_if_fail. References _connectSignals(), _constructWindow(), _populateWindowData(), abiSetupModelessDialog(), AP_Dialog_Stylist::startUpdater(), and UT_return_if_fail. 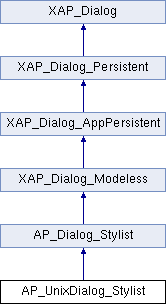 References _fillTree(), gchar, AP_Dialog_Stylist::getCurStyle(), AP_Dialog_Stylist::getStyleTree(), AP_Dialog_Stylist::isStyleTreeChanged(), m_wStyleList, pt_PieceTable::s_getLocalisedStyleName(), AP_Dialog_Stylist::setStyleChanged(), UT_UTF8String::size(), AP_Dialog_Stylist::updateDialog(), and UT_UTF8String::utf8_str(). Set the style in the XP layer from the selection in the GUI. References Stylist_tree::getStyleAtRowCol(), AP_Dialog_Stylist::getStyleTree(), AP_Dialog_Stylist::setCurStyle(), UT_DEBUGMSG, and UT_UTF8String::utf8_str(). Referenced by _fillTree(), and destroy(). Referenced by _fillTree(), destroy(), and setStyleInGUI(). Referenced by _constructWindow(), and _fillTree().